Selfeeder Multipurpose Units - Sugino Corp. The Turret Head with four uses in one unit. CNC Turret Type Multi-axis Head! 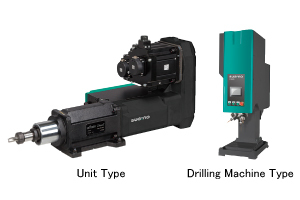 The "CNC Turret Head 4TH3S" is a compact single unit with four uses and Selfeeder Varimec as its driving force. It incorporates a tool change mechanism and can also be used as an Automatic Drill Press. Process integration is possible by selecting the required spindle from the four axes and applying a suitable program. Because it uses cam indexing and notch piston positioning, the CNC Turret Head 4TH3S can perform rigid machining with a high degree of precision. The large degree of freedom when it comes to manufacturing a mounting stand is because it is driven by the "Selfeeder Varimec SSV3" and other components. 1. The selection of models should be based on the shape, material quality, machinability, tool diameter and material, rotation speed (machining velocity), etc. of the work piece. 2. The drilling capacity displayed in the above table is based on values representing a drilling depth of two times the diameter of the drill. 3. Indexing time is turret turning time. It does not include spindle start/stop time. 4. When mounting the Turret Head, ensure that the SSV3-7100THB Type is used at 7,000 min-1 or less. 5. The servo motor feed shaft has a holding brake. Turret Head with four uses in one unit. CNC Turret Type Multi-axis Head! The "CNC Turret Head Model 4TH5" is a Multipurpose Unit that incorporates functions to sharpen bearing surfaces, drill, chamfer and tap. This ensures a space-saving and efficient machine. The combination with a slide unit ensures high machine stiffness, while CNC facilitates rigid tapping. 1. The selection of models should be based on the shape of the work, material, machinability, tool diameter and material, rotation speed (cutting speed), etc. 2. The upper row of the maximum Drilling & Tapping Capacity table represents the maximum drilling capacity; the lower row represents the maximum tapping ability. 3. The drilling capacity displayed in the above table is based on values representing a drilling depth of two times the diameter of the drill. Maximum tapping capacity is a figure 1.5 times the screw diameter using spiral or point tap. 4. The servo motor feed shaft has a holding brake. This multipurpose unit “Selfeeder Dual” creates highly accurate drilling and tapping within a single piece of equipment. It features high-powered servo motors used for perfectly synchronized ram feed and spindle rotation. The dual servo feature allows programming of feed rates, distances, spindle rpm, and thread pitch without any mechanical adjustments. The machine is equipped with high-power servo motors for ram feed and spindle rotation to achieve perfect synchronization. It enables highly precise and efficient drilling and tapping. Powerful unit with capacity to tap large holes up to M27 in aluminum. For changing the thread pitch, just replace the tools and enter a program. Gear replacement is unnecessary. Moreover, various built-in machining patterns are provided, allowing you to machine workpieces simply by operating the touch panel. Unit type can control up to 4 units with one programmable logic controller. Drilling machine type can be operated on the same day by connecting the main power supply. Four units can be controlled with one programmable logic controller. Reduced 50％ less installation space. 2. The upper row of the maximum drilling/tapping capacity section shows the maximum drilling capacity. And lower row shows the maximum tapping capacity. 3. The drilling capacity shown above corresponds to a depth equivalent to the drill diameter times two. A spiral type or point type tapping tool is used to determine the tapping capacities. Tapping capacities are conditional on the depth of tapping being limited to 1.5 times the tap diameter. 4. Holding brake is equipped with the feed motor. The right solution is a click away. We're here to help, with questions or guidance to the right Selfeeder product.